I remember my last winter living on the East Coast. The winter seemed colder than the previous year, but that could have just been my age. Perhaps it was my own experiential moment of clarity: I do feel the temperature extremes more as I get older. The week of February 9-15, 2003 was a cold week in southern New England. It had been in the 20s and 30s most days that week, including the day we got the word that there would be a march on February 15 in New York City; a march to protest the decision by the George W. Bush administration to invade Iraq; to go to war in Iraq. Bush’s decision was advanced by a calculated series of speeches, interviews, and commentaries by those supporting a preemptive invasion of Iraq. Included in his “thought process” was a personal motive. In October 2002, CNN reported that “in discussing the threat posed by Iraqi President Saddam Hussein, Bush said: ‘After all, this is the guy who tried to kill my dad. '” So according to “W”, why should we be focused on Iraq? It’s important because “[Saddam Hussein] is the guy who tried to kill my dad.” Obviously, for Bush, dealing with Iraq is as much (or more) a personal issue as a strategic issue. In January 2003, Bush used his State of the Union speech to continue to set the stage for an Iraq invasion. As reported in the Washington Post, Bush declared that Iraq was becoming a nuclear threat: “The British government has learned that Saddam Hussein recently sought significant quantities of uranium from Africa. Our intelligence sources tell us that he has attempted to purchase high-strength aluminum tubes suitable for nuclear weapons production.” Both American and British Intelligence services were wrong. We later found out that an attempt to verify Iraq’s African uranium connection refuted the conclusions of the two intelligence (?) services. Instead of correcting their poor intelligence conclusions, the Bush Administration later doubled-down by attacking the messenger, Ambassador Joe Wilson. On a cold winter day, February 15, 2003, less than two weeks after Secretary Powell traveled to the U.N., I chose to join between 250,000 and 300,000 of my closest friends, and went into Manhattan to march in solidarity against the idea of war with Iraq. Although the media barely covered it I remember walking, with a friend of mine, the six or so blocks from Grand Central Terminal to join the marchers along the avenues east of Fifth. My personal experience, my memories are clear: there were hundreds of thousands of people along the avenues and streets between Fifth Avenue and 1st Avenue, and between 42nd Street and 65th Street. Yet when we watched the reports that evening and the next day, you’d have thought there were a few hundred people wandering aimlessly in that part of Manhattan. (For a bit of video from that cold day, try this link to one marcher’s footage.) I purchased a 2′ x 3′ poster that day clearly showing my political feelings. 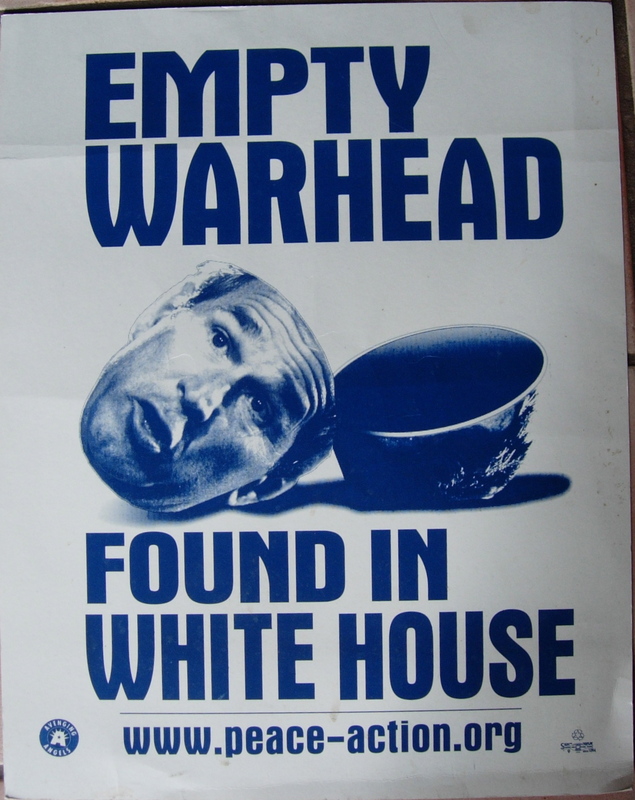 It featured a likeness of President George W. Bush with the headline “Empty Warhead Found In White House”. Three months after Colin Powell’s U.N. presentation, and our march through Manhattan, “W” ended his Iraq war. With the flare of a Cecil B. DeMille film, Karl Rove orchestrated George W. Bush’s arrival on a U.S. aircraft carrier, wearing a flight suit, stepping onto the deck with the now infamous “Mission Accomplished” banner as a backdrop. That was not really the end of the war. American troops would spend an additional eight years in Iraq cleaning up the mess and dealing with the even longer war in Afghanistan. In 2008 as he was about to leave office, President George W. Bush negotiated and the Iraqi Parliament passed a US-backed security agreement and a Status of Forces Agreement (SOFA), which called for the removal of all US troops from Iraq by December 31, 2011. Charles Krauthammer opined in the January 16, 2009 issue of the Washington Post (as Obama was about to take office,) that “it is the repeated [U.S.] pledge to conduct a withdrawal from Iraq that does not destabilize its new democracy and that, as Vice President-elect Joe Biden said just this week in Baghdad, adheres to the “Bush-negotiated status-of-forces agreement” [emphasis added] that envisions a U.S. withdrawal over three years, not the 16-month timetable on which Obama campaigned.” So “W” negotiated a 3-year withdrawal agreement with the Iraqi government, and it appears Krauthammer thinks this, when compared to Obama’s 16-month preference, is an “OK” idea. Signing a Status of Forces Agreement requiring the full withdrawal of U.S. military forces from Iraq on a fixed three year timeline demonstrated a real flexibility on Bush’s part. It demonstrated a pragmatism and willingness to put the national interest ahead of partisanship that few of us believed he possessed. It is largely thanks to Bush’s acceptance of his own bargaining failure that Barack Obama will inherit a plausible route to successful disengagement from Iraq. Conservatives now like to claim the SOFA as a “Bush-negotiated” success. But Bush entered the SOFA negotiations looking for something entirely different than what emerged at the end. The U.S. went into the SOFA talks intent on obtaining legitimacy for a long-term military presence in Iraq once the Security Council mandate ended. When negotiations began, it was widely assumed that Bush would extract from the Iraqis an agreement which made the removal of U.S. troops entirely contingent upon American assessments of conditions on the ground. There were widespread discussions of permanent U.S. bases and a Korea-style presence for generations, an assumption that the U.S. would retain a free hand in its operations, and an absolute rejection of an Obama-style timeline for withdrawal. But Iraqi leaders, to most everyone’s surprise, took a hard-line in the negotiations. Their tough line was encouraged by Iran, no doubt, as stressed by many frustrated American commentators. But it also reflected Iraqi domestic considerations, including several rounds of upcoming elections and an intensely strong popular Iraqi hostility to the U.S. occupation under any name. The Iraqis were also helped by the calendar. As negotiations dragged on, the December 31 deadline loomed large, threatening to leave the U.S. troops without any legal mandate to remain in the country and forcing the hand of American negotiators. Finally, the Iraqi leaders clearly kept a careful eye on the American Presidential elections and used Obama’s stance to strengthen their own hand in negotiations. So let’s get this straight. Bush negotiated an agreement to leave Iraq. Implicit to Krauthammer (and other conservatives) was the “fact” that this new SOFA would be renegotiated. If there seems to be a bit of deja vu here, one only has to look at the so-called Bush Tax Cuts, which were—by design—not permanent. Bush and the Republicans in Congress agreed to a limited term for the cuts and now deem any decision to let them expire—as designed—as a tax increase. If it was crucial to make the tax cuts permanent, then why didn’t Bush, et al, write that into the legislation? If it was crucial that the SOFA be extended, then why wasn’t that negotiated by Bush? Krauthammer’s revisionist history doesn’t pass muster. I’m certain there are more issues, including the weariness of most in Iraq to eight years of American occupation. So let’s do what George W. Bush negotiated. Let’s leave on December 31, and put Iraq in the rear-view mirror. Maybe then I can let go of my poster from that cold day in February 2003. « Time For The “Corporations Are Not Women And Men” Amendment. you�ve gotten an crucial weblog proper here! would you wish to make some invite posts on my weblog? Hello! I just want to give a huge thumbs up for the good information you have right here on this post. I might be coming again to your blog for more soon.